Abstract: The definitive text on the full-spectrum of neurology for decades, Adams and Victor's provides the treatment and management strategies needed to confidently handle both common and rare neurologic conditions. Written in a clear, consistent tone, this classic resource will meet the needs of the seasoned professional or the aspiring clinician. 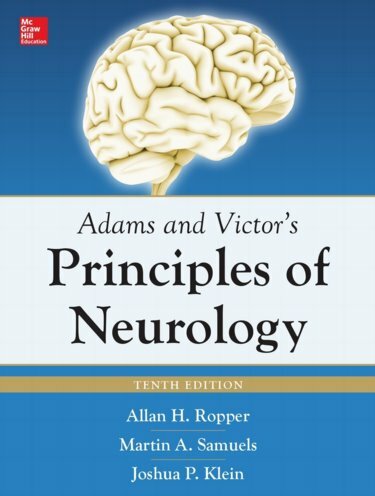 Written from the perspective of the general neurologist, Adams and Victor's has been hailed as the most detailed, thorough, and authoritative text available on the subject. Adams and Victor's Principles of Neurology, Tenth Edition describes the various categories of neurologic disease and the main diseases that constitute each. Each subject is introduced by a detailed discussion of the symptoms and signs of disordered nervous function, their anatomic and physiologic bases, and their clinical implications. ... The Tenth Edition is highlighted by the welcome addition of full-color photographs, expanded coverage of important subspecialties, and an increased number of tables and figures. Edition after edition, Adams and Victor's has stayed true to its original mission: to provide a well-written, readable text emphasizing a disciplined presentation of clinical data and lucid descriptions of underlying disease processes.